Dozens of mayors and councillors have made a show of strength for demands for a new financial agreement with Confederation Building. Dozens of mayors and councillors from across Newfoundland and Labrador have made a show of strength for demands for a new financial agreement with Confederation Building. "The status quo is no longer acceptable. 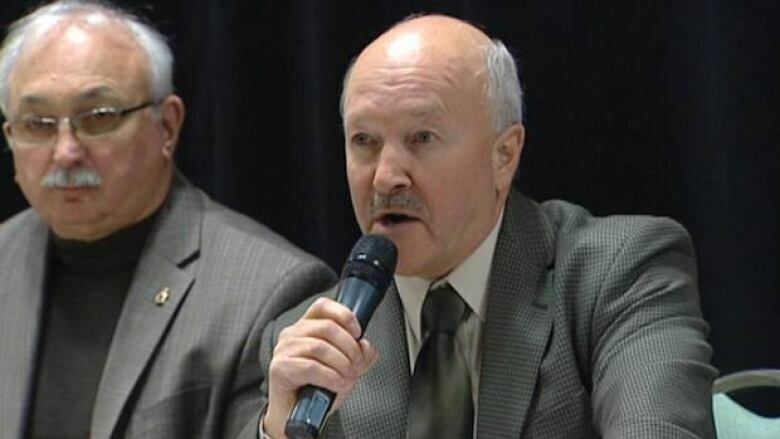 We need to move forward," Churence Rogers, president of Municipalities Newfoundland and Labrador, said to loud applause after a two-hour, closed-door meeting Monday in St. John's. Although last week's speech from the throne signalled that a new municipal fiscal system is in the wings, town leaders said they want immediate financial help, as well as an iron-clad guarantee for a long-term solution to the growing challenges for cash-strapped communities. "The people here today have told me clearly that they want to see something substantial in the 2012 budget," Rogers said. "They want to see a show of good faith from the provincial government." Milltown Mayor Georgina Brushett said the mood at the meeting showed that municipal leaders are fed up with long-delayed promises. "This is fantastic. Absolutely," she said. "I think this is something that should have happened a long time ago." Rogers said municipalities are developing a plan of action against the government if the budget does not meet members’ expectations.